Coming from a country with only two types of season - sunny and rainy seasons - it never bores me to amaze the different kind of snacks that other countries have to offer during colder days. I'm pretty much a sucker for uniquely made food, especially those with insane fragrance. 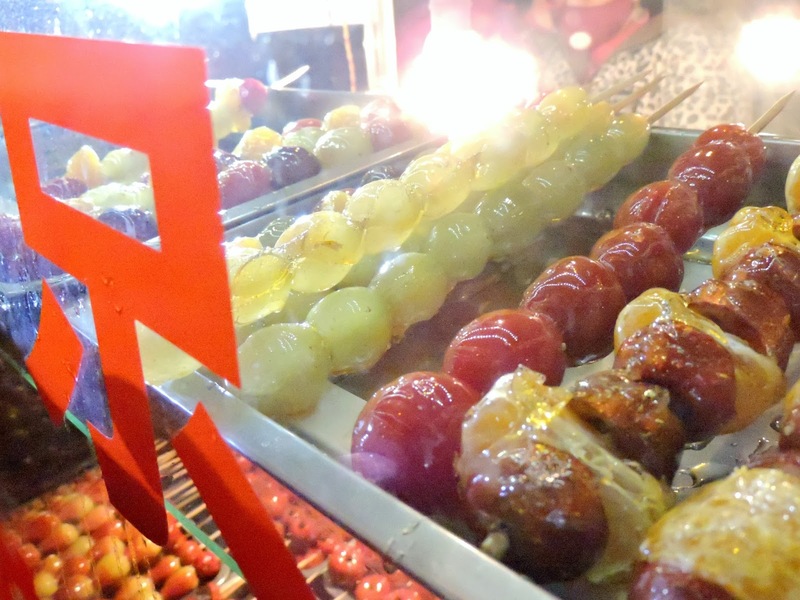 So, in this post, I'd like to share with you guys 3 snacks (which I could not find anywhere near my hometown) that I could never missed when traveling in China. For candy lovers out there, never ever miss to try this thing! You can only find this candy when the temperature starts to drop. It is extremely easy to get, pretty much in all street/night market in the country. It's not even hard to make - simply stick some fruits or nuts with an arm-long wooden stick and coat it with mixture of sugar and honey. Place it outside and wait for it to freeze slowly. Easy. There are few kinds of fruit and nut they use, those are strawberry, blueberry, grape, orange, kiwi, hawthorn, walnut, chestnut etc. Each of them priced differently, ranging from RMB 5 - 12. May vary for each location. 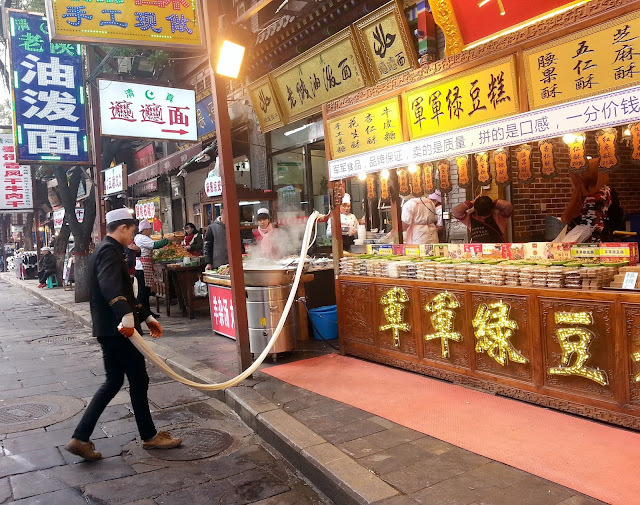 Some places in China, the locals consume tons of mutton and lamb to stay warm. 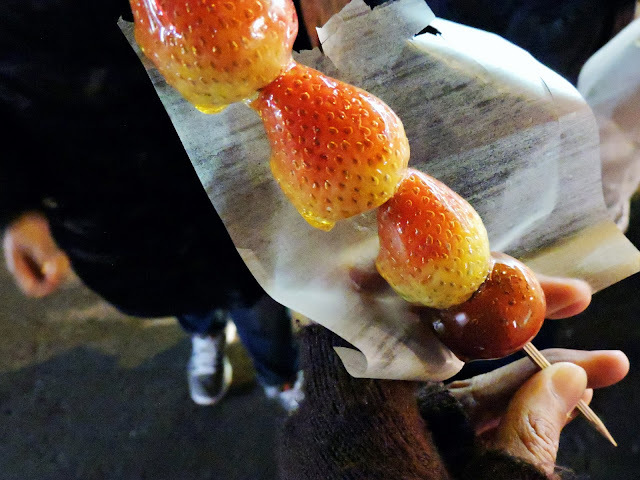 Hence, you won't find it weird that the people here are selling theses skewers in the size XXL. Each skewer cost only RM 10. Having two of these would be enough for an average human-being. Well, you are nowhere near average. Then have it your way. One of the reason that I can't forget these skewers, is the strong smell. You could literally smell it from a kilometer away. It's actually caused by the spice they used - cumin, chili flake and white pepper. Put these on grill fire and you will get an aromatherapy for food lovers. If you ever planned to travel to Xi'An, missing this out would be a huge mistake. Here, they're not only selling the snacks, but also present to you the way they produce openly, pretty much like a live show. The process involves mixing, pulling, baking and cutting in large scale. All of these are displayed publicly to attract visitors. This particular snack isn't only sold during colder time, but I would prefer to buy when the weather isn't so high, or else it would get a little sticky. Each pack is sold differently depending on its flavor, ranging from RMB 20 - 30.